The MBX7TR is great as it is, I have no issues with it, and there are many more that dont. The "Mythical" fragile arms - many of us have not broken any - toe pills perhaps but no arms. I race 4S, I don't bash on 6S! Either way, thanks Adam for Chiming in. Much appreciated. stanleyw808, gt racing and 1/8 IC Fan like this. typical I just bought myself a new Mugen MBX7R to start my new racing in 2018 if I knew before I bought it the MBX8 was coming in 2018 I would have waited oh well, hopefully the mbx7r can be upgraded to the mbx8 if needed I wonder??? You will be fine, there is nothing wrong with the MBX7R, the MBX8 is just more refined... But none of us have one yet. So no worries, the MBX7R will serve you well, regardless of upgrading. In the end one spends more on upgrades than the new car, so just wheel the MBX7R and wait til the MBX8's pop up on here in the BST. Youll be fine. I am not switching anyway, Ill be getting my son the new car first. I went back to running my MBX7! I have two issues. I was setting up my throttle linkage and I had part E0822 left but can't figure out what it's for. My other problem is that I bought the Hudy servo horns (clamping style) and I'm not sure what's needed to be done to fit the throttle horn to my linkage. 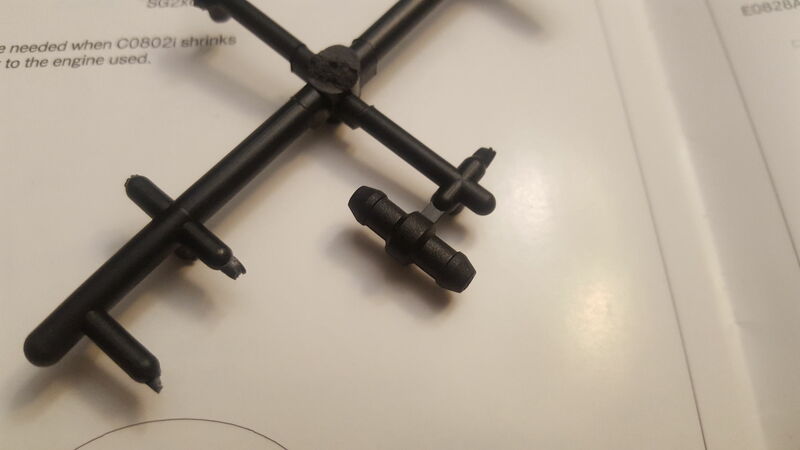 The screw that comes with the kit (7TR) doesn't fit the servo arm. I would need to use an M3 screw. Would I need to get the throttle linkage for the XB8 in order to fit the Hudy saver onto my 7TR or is there something else that can be done? Edit: I meant to post this in the 7T thread. Last edited by Cardiak; 01-23-2018 at 04:16 AM. That part innthe pic should be for the fuel and exhaust lines so you can connect the. Together when you remove the engine and pipe or pull the tank out and not have to worry about getting fuel all over the place or contamination (dirt) innthe lines. Thanks for the responses. Do you guys know what I need to do in regards to the servo horn? Thanks. Do you know if the XB8 linkage will fit as well? [QUOTE=Cardiak;15137476] My other problem is that I bought the Hudy servo horns (clamping style) and I'm not sure what's needed to be done to fit the throttle horn to my linkage. The screw that comes with the kit (7TR) doesn't fit the servo arm. I would need to use an M3 screw. Would I need to get the throttle linkage for the XB8 in order to fit the Hudy saver onto my 7TR or is there something else that can be done? Total honesty - I would recommend using the stock Mugen throttle/brake servo arm. It works and fits perfectly. I have tried aluminum ones in the past and you end up having to modify the plastic pieces, add spacers to get it aligned properly, etc. It is sooooo much easier to use the stock piece. I do use the Flashpoint aluminum arm for steering. stanleyw808 and gt racing like this. Eh. I've already purchased it so I want to make it work. Do you know if the Xray linkage will work or any kit's linkage or am I forced to drill a new hole for it to work? Last edited by Cardiak; 01-24-2018 at 03:48 PM.